The term wood preservatives defines that the wood preservation is the process of preserving wood from the wood destroying agents like insects or fungus so that the life span of the wood can be extended. It refers to the treatment of wood with chemicals to impart resistance to degradation and deterioration by living organisms. The proper application of chemical preservatives can protect wood from decay, and stain fungi, insects and marine borers, thus prolonging the service life of wood for many years. Everybody is well aware that wood is prone to attacks by insects and enviromental factors such as moist,midew,decay etc.This is a fact and no need to discuss more about it. Everybody is also well aware that use of finest quality wood preservative increases the life and structural strength of wood greatly. 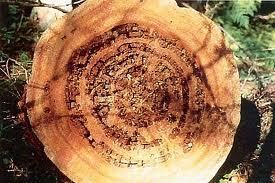 One thing must be remembered that wood preservative must contain sporicide, fungicide,termicide and miticide. Must be enviromental freindly and safe to human and cattles and birds. Also one has to offer many formulations according to specific species of wood/timber. Queen lives in ground up to 20 feet deep. Workers tunnel to surface under a piece of wood and start eating it. If they can't reach wood from ground, they build tubes of dirt up to the wood. Some tubes are self-supporting and reach up to 2 feet. Others are attached to other structure such as block wall and have been known to go up 8 feet to reach wood. Termites never work in the open. Always in wood or tubes. 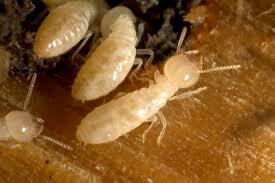 There are only two types of homes in the world those with termites and those that are going to get termites. Adults lays eggs in open pores of wood. 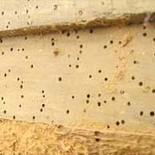 Larvae eat into wood causing honeycomb. After pupating and becoming adults, they bore out of the wood leaving behind small holes and a pile of powder or "sawdust". 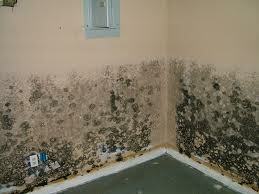 A wood-decay fungus is a variety of fungus which has the ability to digest wood, causing it to rot. Wood-decay fungi include those which attack dead wood, such as dry rot, and those which are parasitic on living trees, such as Armilaria (Honey fungus). 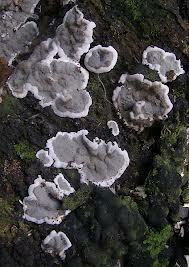 Fungi that not only grow on wood but actually cause it to decay are called lignicolous fungi. They do not necessarily need to decay lignin in the wood to be termed lignicolous. Dry rot fungi decay cellulose in wood leaving behind the lignin as the brown crumbly remains. 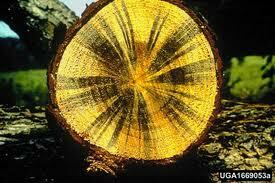 Brown-rot fungi break down hemicellulose and cellulose. Cellulose is broken down by hydrogen peroxide (H2O2) that is produced during the break-down of hemicellulose. Because hydrogen peroxide is a small molecule, it can diffuse rapidly through the wood, leading to a decay that is not confined to the direct surroundings of the fungal hyphae. As a result of this type of decay, the wood shrinks, shows a brown discoloration, and cracks into roughly cubical pieces; hence the name brown rot or cubical brown rot. Major cause of failure in hardwood transmission poles and other hardwood products that are in ground contact. Usually start on the outside of wet wood and works it way inward. A slow and less obvious degradation. The problem is that the hyphae grow strictly within the cell wall and never enter the cell lumen or pits where many treatments are restricted. Do not destroy wood - only degrade it. The dark color of the hyphae causes the wood to look blue or black thus losing its appearance value. Also, because it destroys the pit membranes, it makes the wood more permeable. Staining fungi live on sugars in cell lumen; therefore, hyphae are in lumens and through pits to other lumens. Grows on surface of wood where moisture content is 20 - 25 percent. Termisolve since a long time is providing protection to wood and wood products. Termisolve is high power concentrated uniquely many formulations based wood preservative. Termisolve is one of the best wood preservative which is ready to use anywhere, any portion of any type of wood, any type of application wheather it is indoor or outdoor. Termisolve is ideal for any type of wood or wood products or engineered wood. It protects deck, doors, fences, railway sleepers,boats,ladders, utility poles ,furniture, garden furniture etc. etc. Virtually, where there is wood ,Termisolve is ideal there. Termisolve is ready to protect wood from decay,fungi,midew,termites and wood destroying insects and factors. Termisolve is preventive and curative for all species of borers as painted hickory borers, bostrichid wood borers,carpenter worm, cottonwood crown borer,readheaded ashed borers,anobiid powder post beetles,ash borers, poplar and willow borers,subterrain termites,longicorn beetles,wood borer weevil etc. etc. Termisolve prevents all types of wood damaging insects and factors and prevents fungi, black spot and black and yellow powder. Termisolve is available in many formulations as par the requirement of custmor.Generally it is available in creosote base, zinc base,copper chloroquinolate base ,napthenate base and CCB base also which is water based. Termisolve is available in different packings ranging from 250 ml to 200 ltrs for domestic market and 1 gl to 5 gl for international maket. 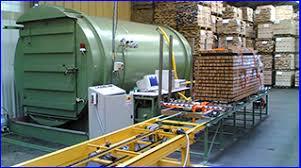 We provide private labelling facility also. We offer a comprehensive range of wood preservatives i.e. from spray application for end custmor to chemical pressure impregnation wood preservatives for seasoning plants and plywood manufacturers.